I've added an updated version of "Campfires" to the Members Gallery this evening. I've tried to capture a bit of the aurora around the poles with this latest version, which I rendered using Lightwave 11. I've also used a much higher resolution map for the city lights, so they should show a lot more detail on today's larger displays. I can see my hometown in the 2560 x 1600 version. You can check out my renders from 2002 and my original 1999 version for comparison. Whichever part of our globe you call home, I hope you all have a wonderful 2013! Like most of you, I was heartbroken by the tragedy in Newtown, CT last Friday. I have been hugging my own first grader extra tight ever since. Here is my meager tribute to the 27 victims. 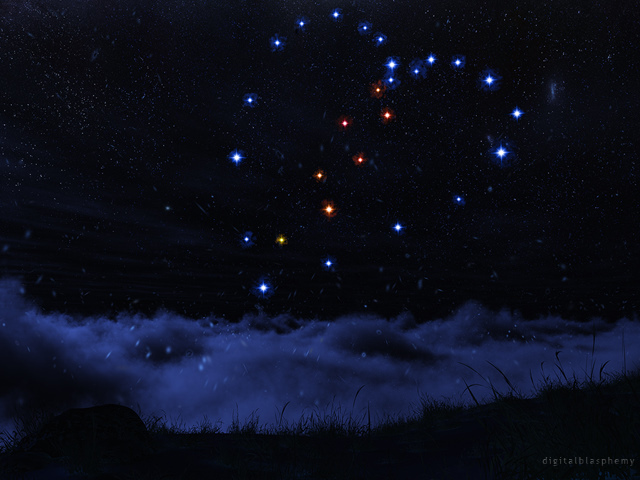 The render has 20 (young) blue stars and 7 (older) red/yellow stars forming a new constellation in the heavens. If you would like to download the wallpaper it is available in the free gallery. There are more resolutions available to my Members in the here. May the victims rest in peace and smile down on the loved ones they left behind. Vue 11's new "360 Ecosystems" (populating instances on all sides of an object, rather than just the "top") opens the door to a lot of interesting effects, but the first one that came to my mind was Christmas lights. After bedecking "Sleepwalker Wood" and "Gotham Garden" the next scene that cried out to me was "At World's Edge". I have also added a version with white-lights to the Pickle Jar. Let me know which version you guys prefer (by leaving a rating) and I will feature that one in the gallery. I also wanted to mention that my friends at Zimnix has produced a free Android Live Wallpaper (with blinking lights and snowfall!) based on my "Sleepwalker Wood" wallpaper. Please leave a review if you enjoy it!! I thought I would take a break from the Christmas/seasonal wallpapers for a moment and do something a bit different. I've added "Unchained" to the Members Gallery this morning (dual and triple-screen versions available). I created this project to illustrate how I feel creating art on my main machine (Bucephalus) after only being able to work on my laptop for a long time. You are, of course, welcome to make up your own story. I hope you enjoy it!! 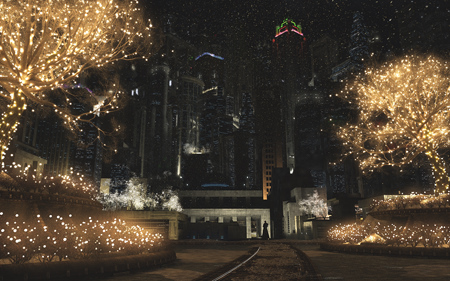 I've added a third (probably final) version of "Gotham Garden (Christmas)" to the Members Gallery this morning. After trying Vue's volumetric snow in the first version, and no snow in the second, I have come back to the original snow from the winter/day version (which is not available in the free gallery btw). A number of folks suggested multicolored lights. I tried that but I wasn't very pleased with the results. Sorry! I will get cracking on the multiscreen versions next! After I figured out how to light up the trees in "Sleepwalker Wood" I went looking through my gallery for other candidates for arboreal illumination. The one that jumped out at me first was "Gotham Garden (2010)". I've posted two versions of this scene in the Members Gallery. The first (now in the Pickle Jar) used Vue 11's volumetric snow, but the effect is a bit grainy. 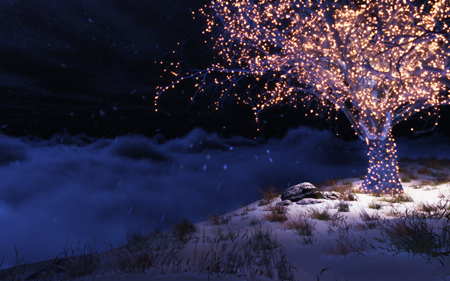 The featured version has no snow (it's an early December scene I guess) but I may add it in a future version. I must say that Vue 11 is very peculiar about saving files. More than once I have worked on files and saved them only to have them not open later or open but be radically altered. I've lost two projects to this in the past couple of weeks. Anyway, I hope you enjoy this little update of an old favorite! One of the new Members who signed up on Black Friday just so happened to be an IT director at Stanford University. He wrote me over the weekend asking permission to use my work on the "very large display" he had just worked to install in the Peter Wallenberg Learning Theater on the Standford campus. Of course I gave him permission with the caveat that he send me a few photos of my work in action. 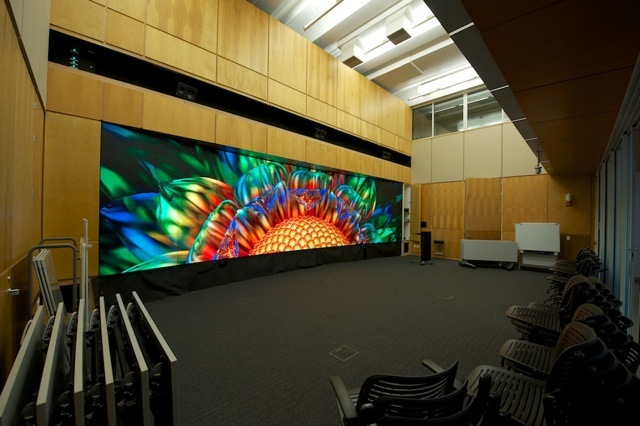 Pictured above is "Sunburst Daisy)" on the 17,280 x 4,320 monster screen. I've posted a few more of the pics on my Facebook page. This is, of course, nirvana for me. I may need to go see it in person! 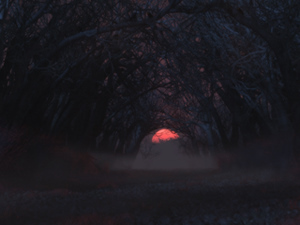 I've been using my "Sleepwalker Wood" scene to learn how Vue 11s new "360 Ecosystems" work. To that end there are now several different versions of the forest in the Pickle Jar for Members to choose from (including this blue one). You can help me out by rating the images you like and I will use the highest rated render for my main gallery. Thanks!! 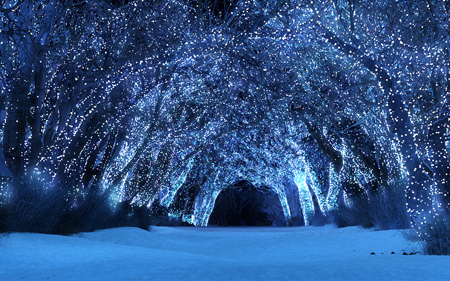 I've added the dual and triple-screen versions of "Sleepwalker Wood (Winter/Night)" to the Members Gallery this morning. I went with the more popular "deeper focus" version for this one. Vue 11 finally includes the ability to populate ecosystems on all sides of an object (previously they could only grow "on the top" of an object). I immediately thought of Christmas lights. Anyway, it was a bit more complicated than simply clicking a button but after much trial and error rendering (on my Asfaloth laptop no less) I think I am getting closer to happy. So many of you enjoyed the "zombie-less" version of "Sleepwalkers" that I put in the Pickle Jar that I thought it might be worthwhile to create a winter version for the Members Gallery. I left the zombies out of this one but they may show up in the Pickle Jar later ("White Walker" style?). 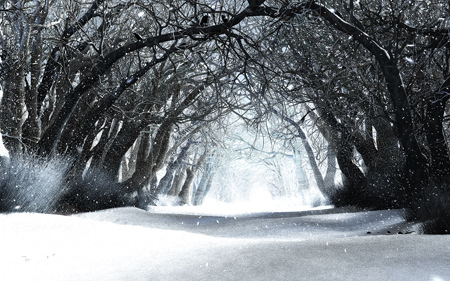 I've added my 2012 version of "Winterborn" to the Members Gallery this morning. I actually put this one together a few weeks ago, but it seemed too early in the Autumn season (here in the Northern Hemisphere) to post such frosty wallpaper. It's probably still a bit too early but I think this one turned out nicely and it has never been in my nature to "sit on" a wallpaper. Here's the 2001 version if you are interested. I always thought the original render was a bit dark so I wanted this version to be brighter and have a little more "magic". I hope you guys enjoy it!! One of the problems of using "pre-release" software is that the possibility of show-stopping bugs. I ran smack into one of these with the new version of Vue 11. I came up with a nice winter update to "Green & Gold" and even managed to render a first draft. Unfortunately, the software crashed as I was making revisions and now (for some strange reason) I am unable to open my scene file. I've contacted the developers about the problem but I haven't heard back yet. I'm not sure I will ever be able to reopen this file to do any more work on it, and I don't have the hear to redo everything from scratch right now. Rather than sit on the render I have decided to post it in the Pickle Jar so the interested Members can check it out. Quite a few Members wanted to see what "Sleepwalkers would look like without the zombies. Leaving them out makes the title a bit nonsensical but it does expand the uses for the wallpaper beyond Halloween. I've added the dual and triple-screen versions of "Sleepwalkers" to the Members Gallery this morning. I've shifted the scene to the left for dual-screen users everything isn't split down the middle. I will see about maybe rendering a version without the "walkers" over the weekend. Check out the rest of my Halloween wallpapers here! I also wanted to mention that the DB Android App has been updated to squash a few bugs and we've added a free HD wallpaper for non-Members. I've added "Sleepwalkers" to the Members Gallery this morning. For my Halloween wallpaper this year I set out to create a creepier version of "Elegy" and mix in elements from "Forest of the Shades" and "Dark Wings". The title also refers back to one of my first Halloween wallpapers. Non-Members can download a wallpaper pack containing all of my "Sleepwalkers" resolutions from TrialPay. PS: Please be sure to check out the new Digital Blasphemy app in the Google Play store! I've had something of a love-hate relationship with Android for a past few years. On the one hand, Android a lot more "customization-friendly" than Apple so I think it works best with my artwork. On the other hand, the default webkit doesn't play nice with my Members Gallery and it is a hassle for my Members to download my work. That is why I am thrilled to announce that the "official" Digital Blasphemy Android App is now live on Google Play. DB Member Paul Miller put in a lot of hours coding it and I provided input and suggestions as needed. Members can use it to access my work on the go and it makes it very simple to set the wallpaper on your device. You can also read my updates, rate the images and leave comments that will appear on DB. Non-Members can use it to browse the gallery and download the free mobile resolutions but cannot rate images or leave comments. This is version 1.0 and (as Paul says) "There's still an awful lot on the todo list". I am really looking forward to seeing it develop after guys start making suggestions!! I am experimenting with ways to offer my wallpapers to non-Members on an a la carte basis. I am going to be going through my Top 10 list and offering Wallpaper Packs through Trialpay (through which I also offer a 1 month trial subscription). So far I have "Sierra Autumn" (single-screen and mobile resolutions) and "Portals" (all resolutions) available for download and I hope to add more if they prove popular. It took nearly a week but my dual and triple-screen versions of "Sierra Autumn" are now available to my subscribers. As with the single-screen version, I rendered this one twice (one aith autumn colored leaves and one with green) and then selectively mixed the two in Photoshop so I could vary the leaves on a "per-tree" level. The render probably took a day or two longer because I increased the render quality settings from the single-screen version. This one should look significantly smoother. Let me know what you think! My brother Eric was in town from Ohio this weekend. Saturday night Jessie, Eric and I went out to see "Looper". We all thought it was a fun movie and had a great time. I am mentioning it here because around the 2/3 of the way in there is a pivotal scene in a farm house. 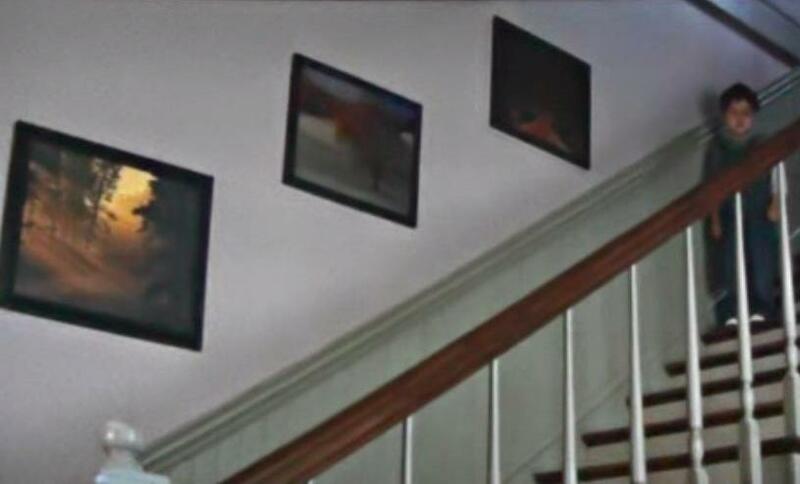 Hanging on the wall of this farm house near the bottom of an important staircase, was a square print of "Idyll"! I nudged Jessie, pointed it out, and whispered "That's my picture!". Now I thought movie producers had to obtain releases for this sort of thing (as has happened to me once before) but maybe there is a "screentime" threshold under which it is not necessary. I don't know (will be looking into it) and I wasn't not worrying about at the moment. My work has popped up in a lot of unexpected places this is the first time I've seen it up on the big screen. I must admit that I enjoyed it. If anything it is nice to know people are still enjoying my work 30 years from now! It was also somewhat bittersweet because I know my Dad would have been there with us in the theater. I think he would have enjoyed it even more than I did. Here is a version of the print (on Zazzle) that looks identical to what's hanging in the farmhouse. Keep an eye out for it if you go to see the film (and you should!). COMING SOON: My "Sierra Autumn" multiscreen is halfway finished. I hope to have it up within a couple of days. I'm also working on a little something for Halloween and a little something for people with Android devices. Stay tuned! I've added an Autumn version of "Sierra" the Members Gallery today. This is actually two renders (one with green leaves and one with Autumn colors) which I have layered in Photoshop so I could vary the leaves on a "per-tree" basis. It was time consuming but I hope the results were worth it! You may have noticed the Da Vinci quote at the top of my Works-In-Progress page which reads "Art is never finished, only abandoned". Here is another render which proves this axiom. I posted it on my Facebook Page last night and asked folks what I should do with it. The majority said I should post it in the gallery so here it is. This render is dedicated to my lovely wife Jessica. October 12, 2012 is our 10 year wedding anniversary and this piece was originally created 10 years ago. Te amo! My friends at Disruptive Publishers have added 3 new Dynamic PS3 Themes to the PSN store today; "Castle Dracula" (above), "Moonshadow" and "The Overseer". You can preview the new themes and the entire collection of themes here. I've added the dual and triple-screen versions of "Sierra" to the Members Gallery this morning. This one took nearly 5 days to render at 9830 x 2048 and I had to restart it 3 times due to crashes. I hope it was worth the wait! I've added a new version of "Tharsis" to the Members Gallery this morning. I've also added the dual and triple-screens today. The changes in the new version are mostly in the sky. I've brightened the second Martian moon a bit more and I've added a pale blue dot (with a paler/smaller white one) near the sun. I've read that you can see the Earth and the Moon as separate with the naked eye from Mars so I rendered them as a "double-planet" here. The first version will stay available in the Pickle Jar, even though the changes here are pretty minor. Let me know what you think of the changes and the multiscreen! I developed and rendered this one on Asfaloth while trying to render the "Sierra" multiscreen on Bucephalus. This is the 4th wallpaper I have created since July using the mobile workstation (Cytokinsesis, Arboreal, and Mistveil Mountain are the others). Also:Members can now download images sized at 720 x 1280 (to fit the Samsung Galaxy S3) and at 640 x 1136 (to fit the new iPhone 5). I've also added images sized at 1252 x 626 which my Members can use to take advantage of Twitter's new "Header Photo" feature. Zip files of these collections (I added over 300 files of each size) can be found here. I made a little video showing off how the "Mystic Halo" Live Wallpaper looks on my new Nexus 7 (my first ever Android device). I am a long-time iOS user and I have been very impressed with the degree of customization available with the Android OS! This Live Wallpaper is based on "Circular Logic" from 2004. The free version of the Live Wallpaper is available on Google Play here. The version shown in the video is available (for $0.99) here. Don't be surprised to see a few more DB themed Live Wallpapers pop up in the app store in the weeks/months ahead. Android really seems like the best way to take DB "mobile". Sorry for the audio in my recording btw. It may be difficult to hear me over the sound of Bucephalus roaring the background. Status Update: I am currently working on rendering the Sierra multiscreen on Bucephalus. Sierra is a rather complex scene and the render has crashed more than once over the past week. I think it is still at least a couple of days from finishing. I created a new seasonal wallpaper last week using Asfaloth, but the subject matter is better saved for later in the year (sneak-peek here if you don't mind spoilers). I am going to try to have my collection of 640 x 1136 images uploaded soon for the new iPhone 5. I've added the dual and triple-screen versions of "Nightfall" to the Members Gallery this morning. I wasn't happy with the 7680 x 1600 render that I finished last Friday so I tweaked a few things and re-rendered at 1440 x 3000 for a smoother look. I hope you guys like it. Starting work on the "Sierra" multiscreen today. In other news, today I am celebrating another successful trip around the Sun. Hard to believe it I was only 25 when I first posted this site back in February 1997. Feel free to post in my "birthday thread" on Facebook for a chance to win a free membership/renewal! I've posted a minor update to "Nightfall" this morning. This version is sourced from my 4800 x 3000 print render and addresses some of the issues with my original (squared off clouds, noise). This update overwrites the original in my gallery so you might want to give it a new name when you download it (if you want to keep both versions for comparison). The print version can be found here. I'm still working on the multiscreen render and hope to have it up shortly! I hope everyone had a wonderful holiday weekend! Mine, unfortunately, was not so good. My sump-pump gave out just as the remains of hurricane Isaac was dumping 4" of rain on the DB Headquarters. My basement, including the glow-pong room that I shared a few weeks ago, is pretty much ruined. The table is fine, but the room itself is trashed. Needless to say, we've been dealing with cleanup rather than rendering the multiscreens that I intended. Any kind soul who wishes to help contribute to the clean-up fund can redeem the coupon code "cleanup" for a 30% discount on a new Membership or use it for a discounted renewal here. If you are a lifetime member you can still help out by making a small donation here. Thank you! I hope to get the multiscreens going for Sierra and Nightfall shortly! I've added another new "work-in-progress" called "Nightfall" to the Members Gallery. This is a little project that I was inspired to create after seeing the cover photo of one of my newer Facebook fans. The image was of a beach at night and the surf was glowing with bioluminescence. I wanted to recreate that aspect of the photo but I may have gotten a bit carried away with the sky. Let me know what you think! I've added my second render of "Sierra" to the Members Gallery this morning. You can find my first draft render, which was received very well on its own, in the Pickle Jar. Not a lot has changed a lot structurally. I've tilted the camera up a bit to show off a bit more of the far shore and the ascending terrain. You will also notice that I cut back on the haze/glare so you can see much farther back into the scene. Let me know which you prefer! "Sierra" took nearly 80 hours to render on Bucephalus, but thanks to my new mobile workstation ("Asfaloth") I was able to work on a little something new in Lightwave. The new project is another microscape (a favorite subject of mine) and I am attempting to depict the process of "Cytokinesis" (cell division). It's a bit on the fanciful side, but you probably expect that from me by now. Dual and triple-screen versions are available. Starting work on my second draft of "Sierra" next. I am also proud to unveil the official "Digital Blasphemy Custom Skin Studio" created by my friends at DecalGirl. It's a great way to position the skin exactly how you want it on any of the hundreds of devices that DecalGirl supports. Let me know if you have any requests for images that aren't in the App yet! Added "Sierra" to the Members Gallery this evening. I dreamed this scene up as a counterpoint to "Highland Spring" where you could have a look at the bottom of the valley. The high amount of blurring in the water lead to this one taking nearly 80 hours to render at 3277 x 2048. There are a few tweaks still I would like to make (the render I've posted was actually a "first draft" of sorts) but I thought it looked nice enough to share as is. 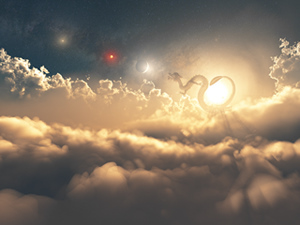 Quite a few of my Members were (rightly) disappointed that my multiscreen version of "Year of the Dragon" was cropped in such a way that most of the clouds were hidden. I have tried to set this right with the dual and triple-screen renders of the night version. The render ended up taking 79 hours (those clouds are expensive) but I hope everyone is happy with how it turned out! I also wanted to mention that from now until 8/19 I have set my education discount to 30% as a "Back-to-School Special". Students, teachers, assistants, tutors, custodians, librarians, administrators, crossing-guards and anyone else involved with education at any level and in any country are eligible to use the coupon code "learning" for both new Memberships and Renewals. The coupon works on the honor system so feel free to use it if you feel like you qualify. Thanks to everyone who helps educate the next generation!! Quite a few Members have requested that I try a night version of "Year of the Dragon" so thought I would give it a shot. Some suggested that I add aurora, fireworks, and other night lights to the scene but, after trying a number of these, I thought it worked best with just the stars and planets. I hope you like it! Let me know what you think in the comments thread. I've added a "work-in-progress" update to 2003's "Arboreal" to the Members Gallery this afternoon. I'm not completely happy with where it's at, but I think it looks nice enough to share while I make my adjustments. This is another piece that I put together on my "Asfaloth" mobile workstation while Bucephalus was rendering "Year of the Dragon". I can't tell you how nice it is to be able to work on projects while my main workstation is busy rendering! Anyway, this one will surely see a revision or two in the days ahead. Let me know what you think in the comments section. Have a great weekend! I apologize for the delay in posting the multiple-monitor version of "Year of the Dragon". I set the scene to render at 7680 x 4800 when I left on my recent trip down to Texas but found upon my return that it had crashed halfway through. My intention had been to source the multiscreen from the larger, poster sized render. I set up a new 7680 x 1600 version of the scene and started it rendering yesterday morning, but it still shows another 24 hours to go. Rather than having everyone wait even longer I decided to take what I had from the crashed render and create a dual and triple-screen versions from that. Just got back from a visit with good friends and family down in Texas. I'd hoped the multiscreen version of "Year of the Dragon" would have been finished rendered by the time I returned but unfortunately it crashed midway and I am reworking it now. I hope to have it finished before tomorrow. What do you think? Should I have kept the beach scene? Lastly, I also wanted to mention that I have replaced the Facebook comment threads in the Free Gallery with new comment boxes from Disqus. I would love to hear your thoughts on my work! Members, of course, still have a direct line to me through my native comments . 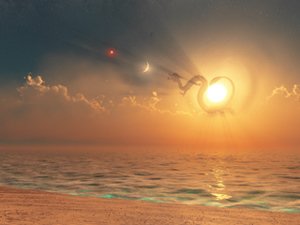 I've added "Year of the Dragon" to the Members Gallery this morning. This piece started out as a commission for a rather well-known individual, but for reasons beyond my control I was never able to deliver it as a private wallpaper. I thought the idea behind it was pretty cool however so I went ahead and fleshed it out. I wonder if anyone can guess who the original recipient was supposed to be. I've added the dual and triple-screen versions of "The Eye of Aquila" to the Members Gallery this afternoon. This one took a bit longer than usual to finish because I spent a few days trying out some different changes to the single-screen. Some people really like this one while some others really don't. . . I've added the dual and triple-screen versions of "Magnetar" to the Members Gallery. It is actually a 7680 x 1600 section from a larger 7680 x 4800 render so the magnetar itself is much more prominent. I thought this was preferable to adding more empty space on the sides but opinions may differ. I am interested to hear your feedback in the comment section. "The Eye of Aquila" has turned out to be somewhat polarizing. Some folks love it and others feel it is too busy (and purple). To be honest I am still trying to decide if I want to tweak it or not. If you've been following my work for a while you probably know that I always have a bit of a quandry with my space pics. Do I show the view "from space" or is it better to create a view "from the ground"? In the case of my "Magnetar" I've decided to do both and I have added "The Eye of Aquila" to the Members Gallery this morning. What do you think? Does it deserve its own place in the gallery? I also wanted to mention that all of my Zazzle posters and canvases are 50% off for the rest of today if you use the coupon code "ZBDAYARTDEAL". I've posted a new version of "Magnetar" in the Members Gallery this morning. The first render (available henceforth in the Pickle Jar) was my first wallpaper developed and rendered completely on a laptop (Asfaloth). For this new version I employed my main workstation (Bucephalus). I rendered the background and nebula first in Vue d'Esprit, then used that for the background for my magnetar in Lightwave. I then brought that render back into Vue to add foreground dust. I hope you like the update. Let me know what you think!! I was pretty confident that the new "red" version of Mistveil Mountain would be my gallery version when I started rendering the multiscreen. Now I'm not so sure. The comments are mostly in favor of the new version, but the ratings point to the first render. I've added the dual and triple-screen versions to the Members Gallery this evening, still warm from the 3 day render. I've been working on Asfaloth for the past few days so I'm stoked to get my main machine back. I'm sure there are quite a few people who would like to see the first version for multiple monitors so I will set up a render on one of my other machines ASAP. Unfortunately none of my machines go nearly as fast as Bucephalus so it will probably be a while before it is finished. Sorry! It was recently suggested to me that it has been a long time since I've done an astronomical wallpaper. Time to change that! I've added "Magnetar" to the Members Gallery this morning. It's a project that I have been putting together on Asfaloth over the past few days while the multiscreen version of "Mistveil Mountain" renders on Bucephalus. 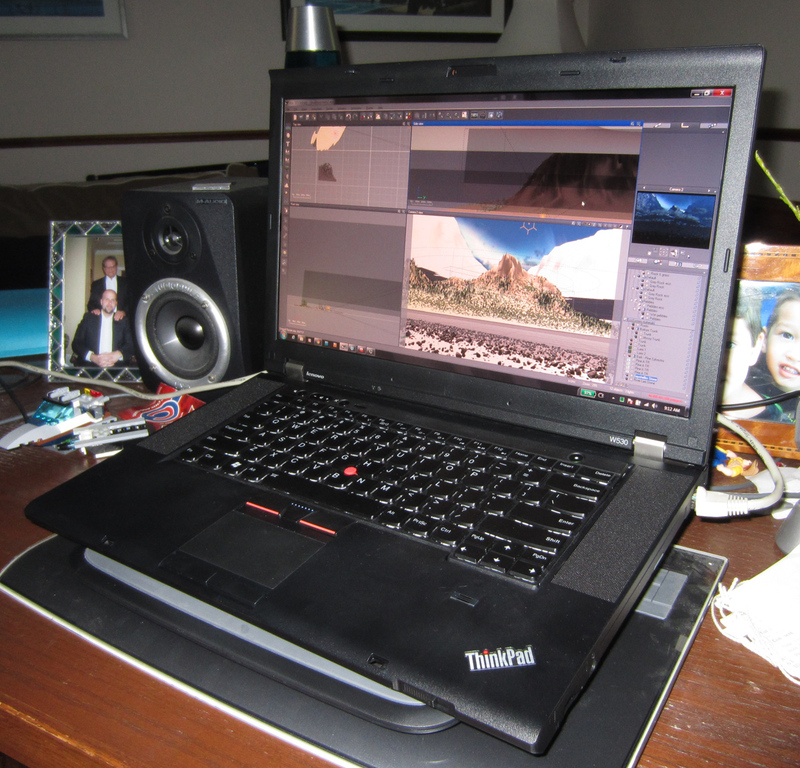 This is, in fact, the first project I've ever rendered completely on a laptop. Yes, it is still a work in progress and I hope to add the finishing touches when I am finally able to get back on my main machine. A "Magnetar" is a special type of neutron star with an extremely powerful magnetic field. My representation is a bit on the fanciful side, but I hope I mananged capture the violence and dark energy of such a body. I modeled most of this using a new program called "Incendia". I hope you like the results! I've added a second version of "Mistveil Mountain" to the Members Gallery this morning. The new lighting scene is inspired by a conversation I had recently with a good friend (a geologist) who just returned from a few weeks above the Arctic Circle. He told me that even at midnight the sky still held a pinkish twilight glow. I've never seen this for myself but this is how I choose to imagine it. The reddish light also seems to set off the aurora better. I've tweaked the snowcover on the taller mountains and changed up the foreground vegetation a bit. There are a few other changes that I will leave for you to discover. The original version is still available in the Pickle Jar for comparison. Let me know which you prefer and I will get cracking on the multiscreen! I've added "Mistveil Mountain" to the Members Gallery. This is my first project rendered and developed on "Asfaloth" (while Bucephalus was rendering the "Dragon's Gold" multiscreen). It is a continuation of the work I started with "The Unveiling" and thus I have left the word "veil" in the title. I'm still exploring Vue d'Esprit's new "height conforming" clouds. I'm still working on exactly what I want for the foreground but I think flowers provide a nice counterpoint to an otherwise frigid scene. Let me know what you think! 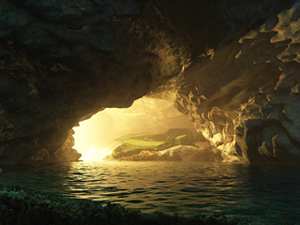 I've added dual and triple-screen versions of "Dragon's Gold" to the Members Gallery this morning. Users with 2 monitors may be happy to see that I shifted the view on to the right so the dragon is not split down the middle. Single screen users who would rather the dragon be more "front and center" may find the new triple-screen version preferable. Just download the one the matched your horizontal screen res and "center" it. I've also updated the free version for Facebook Profile Covers here, though the thumbnail on the Cover gallery page doesn't match the actual cover photo (up until now I've used the dualscreen previews for the cover photo gallery thumbnails). Stay tuned (or sign up for my email list) as I may have another new render to post later today! I've added an alternate version of "Dragon's Gold" to the Pickle Jar this morning. Some folks mentioned that the dragon in the original was a bit hard to spot (indeed some never noticed it!) so he should be easier to see in this version. This version is in the Pickle Jar because I'm not entirely convinced that it is superior to the original. For example, Jessie came in last night and saw the green dragon version. "Oh, but I enjoyed finding it the first time," she said. We've been married almost 10 years now and I've learned that she is usually right about things. Members: Please leave a rating for the new version and let me know which you prefer in the comment thread below. Either way, I'm happy to provide options. A few items to mention today. First I've added the dual and triple-screen versions of "Gotham (2012)" to the Members Gallery. You may notice that the lighting is a bit different from the single-screen version. This render is based off of an newer scenefile and I haven't rendered the new single-screen yet. I hope you like the multiscreen version! Let me know what you think in the comment thread. Say hello to "Asfaloth". 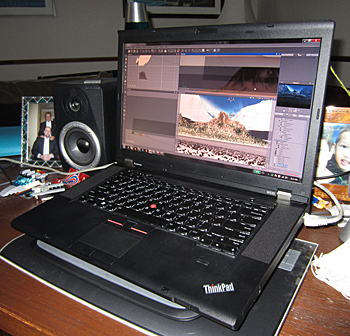 This Lenovo W530 is the newest member of my stable and will allow me to stay busy while Bucephalus is cranking out time-consuming renders. I named the machine for Glorfindel's fleet horse from Lord of the Rings who saved Frodo by outrunning the Nazgul. Asfaloth is loaded with a brand new "Ivy Bridge" i7-3820QM (8MB Cache), 32 GB DDR3 RAM, 1920 x 1080 full-gamut display and a Quadro K2000M. Everything I need to create 3D scenery away from my desk! Noro Lim Asfaloth! I just wanted to say a huge thanks to the Members who make it possible for me to keep my hardware current and have kept me rendering all of these years. My next hardware goal is a swift steed to replace my ancient (5 year old) 8GB "Renderbox". Put simply, these new machines write checks that Renderbox cannot cash. I already have the name picked out but it will have to wait until the economy improves a bit and more folks are signing up. Multiscreen Update: I should have the multiscreen version of "Gotham" up shortly. Hopefully by this afternoon. Want to sign up but maybe you feel leery about using your credit card to a small site like mine (you do know that I have had the same merchant bank for the past 12 years right)? Check out my "TrialPay" option. You can get access to my entire gallery for 1 month (long enough to download everything you like plus see a few new images) just by purchasing something that you may already be interested in! I'm also plugging the company because my brilliant cousin Dan is now working for them fresh out of college. Congrats Dan!! A few items to mention this evening. First, I've added "Dragon's Gold" to the Members Gallery this evening. It's a Father's Day pic (in a non-traditional sense) that I put together as an off-shoot from a commissioned piece that I am working on. Not sure if I am going to do the commission or not but I think this is a nice by-product. I hope you enjoy it! I also wanted to mention that I have added 2880 x 1800 images to the gallery in anticipation of the new "Retina" Macbook Pros. I've added over 120 of them with JPG and lossless PNG versions available. You will find the download links at the bottom of the "Single Screen" resolutions or you can download them all in a Zip file from my Downloads page. Lastly my "Summer Renewal Special" ends tonight at midnight. Members interested in adding time at a discount can save 25% offby using the coupon code "summertime". Let me know if you have any questions. I hope you enjoy "Dragon's Gold"! A few items to report today. First, I have added a few Pickle Jar versions of "Building Blocks" afternoon. They are my early attempts at "hybrid" mandelbulbs. You may notice that I've moved the Pickle Jar images up the preview page (above the download links) so they should now be more visible. I also wanted to mention that I've been working this afternoon on streamlining my mobile site. Have a look and let me know if anything strange on your device. The mobile site is essentially a stripped down version of DB formatted to look nice on smartphones and tablets. Some folks have mentioned that they like the "basic" nature of it even better than my full site. Lastly, I think that maybe I was a bit hasty when I decided to never again offer a coupon special. So many folks have been asking about "the next special" that I may need to reconsider. I am going to try offering specials again from time to time but only to my Members for renewals. My military, education, and returning Member discounts still apply for non-Members. Members interested in adding time at a discount can now save 25% off until midnight 6/14 by using the coupon code "summertime". Added "Building Blocks" to the Members Gallery today. For the past 6 months or so the only program that wouldn't crash my MacBook Pro has been Mandelbulber. This is a render I put together while waiting for "Gotham" to finish processing on Bucephalus. The goal here was to explore "hybrid" fractals which combine up to 6 of the different 3D fractal types. What do you think? I mentioned last time that the only way to move forward with my "Gotham" render was to redo the clouds. They were simply too expensive to render. I've spent the past few days exploring ways of making them render faster. I also wanted them to look more cloudlike and less like smoke. My second version is now available in the Members Gallery. I know there are going to be quite a few people who will prefer the first version and that's fine. I thought it was pretty cool myself when I first put it together. Unfortunately it just took too long to process. It will remain in the Pickle Jar available to my Members for all time. This new version took around 24 hours to render. A lot better but still a long time. Let me know what you think! Speaking of long renders: I ordered myself a new "mobile workstation" yesterday to replace my wonky MacBook Pro (black screen of death every 15 minutes). It should ship out next week and be here in time to meet up with the extra RAM I ordered from Newegg. I'm looking forward to working on new projects while my renders are cooking! If you would like to help me pay the bill for the new machine please think about purchasing a Membership, renewing one, or purchasing a gift for someone else. Did I mention my prints? Thanks!! Not long ago a fan sent me an aerial photo of Chicago at night under a blanket of clouds. I really liked how the city lights cast a glow on the underside of the cloud deck. That photo served as the inspiration for an update to my 1998 "Gotham" wallpaper which I've added to the Members Gallery this morning. Here's the 1998 original (rendered in Bryce using a single terrain and some creative "shading"). Here's the 2012 update using Vue d'Esprit's Ecosystems and volumetric lighting. I might try another with fewer clouds, as I think they came off a bit heavy in the final render. Aesthetics aside, this one took a ridiculous time to process so any future renders are going to have far fewer clouds. I also wanted to mention that I've added a couple of new t-shirt designs to my Zazzle collection based on my "Portals" wallpaper. One uses the square version that I rendered for tablets and the other uses the narrower version I rendered for dualscreens. You can see the rest of my t-shirt collection (plus a few neckties designed by Jessie) here. I will let you guys know if/when Zazzle has their next big t-shirt sale! I've updated the dual and triple-screen versions of "Atoll (Nightfall)" with the new brighter render. The darker first version will remain available in the Pickle Jar. Which do you prefer? I've added dual and triple-screen versions of "Anemone" to the Members Gallery this evening. I've also added a free version designed for use as a Facebook cover image here. I also wanted to mention that our little Jason turned 6 years old today. I won't be able to hold him like this for much longer! I've added a new render of "Anemone" to the Members Gallery this morning. The camera is pulled in even more with this version and the focus is a bit tighter as well. I've also added a bit more blue in the center. The first version will remain available in the Pickle Jar for comparison. A couple of items to mention today. First, I've been working on an update (of sorts) to "Anemones" from 2001 and I'm at a good point to share a render. The update, "Anemone", is available for my Members on the new images page. This one is a bit of a departure from the 2001 version I know. Let me know what you think in the comments section. Secondly, quite a few folks thought my first render of "Atoll (Nightfall)" was a bit on the dark side. I rendered a special version for print (which requires a brighter image) and decided the new version was also an improvement as a wallpaper. You'll find the new render here (with the first version still available in the Pickle Jar). Facebook users can download a free version for your "Timeline" cover photo here. There were a number of reasons why it made send to tear down my "Atoll" scene and rework it to render faster. One reason (see below) was that I wanted to produce a render for multiple monitors. Another was so that I could create the much-requested nighttime version. After posting the multiscreen day version this morning I set to work on the night scene. My first crack at it is now available in my Members Gallery. I'm not sure this is going to be the final version of the night scene, but I thought it looked nice enough to share. Let me know what you think! One of the main reasons I tore down and reworked my "Atoll (2012)" scene was so that I could render a proper multiscreen version in a reasonable timeframe. I'm happy to report that the dual and triple-screen versions are now available to my Members. The free version for your Facebook Timeline cover can be found here. The scene took a mere 32 hours to render at 7680 x 1600. I think it turned out rather well myself. What do you think? I was very pleased to read your comments on Atoll but I also felt bad for my multiscreen users. They knew, correctly, that I wasn't going to tie up Bucephalus for another 3 weeks to produce a 7680 x 1600 version. However, as I was working to produce a high res version of "Blue Christmas" (for my longtime partners at Art in Design) I stumbled across a possible reason for the astronomical rendering times. I discovered that if I use standard terrain meshes instead of "procedural" terrains the render times went way down. I bit the bullet and tore down my "Atoll" scene and rebuilt it using the standard terrains. Lo and behold, the new version rendered in under 14 hours! I've added the new version of "Atoll" to the Members Gallery this morning. The water should be less grainy and I've made it a bit more transperent to show a bit more of the corals I had placed there. I've also brightened the gas giant a bit and tweaked the lighting on the planets a bit. You can still find the original version in the Pickle Jar for comparison. I hope you like the new version. I am going to get cracking on the multiscreen (and perhaps a night version) right away! It took far longer to render than I ever dreamt possible, but my new version of "Atoll" is finally finished and posted in the Members Gallery for your review. Vue d'Esprit will let your render very realistic looking mist, but be prepared to wait for it. I did a brief Q&A with DecalGirl that they featured on their Facebook page here. Give it a read if you are interested. Lastly, Zazzle is having a big sale this week in conjunction with teacher appreciation week. Posters and calendars are 60% off if you use the coupon code "TEACHERSWEEK" at checkout. I purchased this one during the last sale. Looking forward to getting busy on some new projects now that I have Bucephalus back! I've added the dual and triple-screen versions of "Synthestructure III" to the Members Gallery this morning. A free version for use on your Facebook "Timeline" cover photo is also available here. My posters are 60% off until midnight (use coupon code "CANVASMOMENT" at checkout). Still waiting for Vue to finish rendering my tropical scene (sheesh!). I've add my final "Synthestructure" update to the Members Gallery this morning. I've tweaked the metal textures a bit so hopefully they now have a bit more "luster". I've left version 2 available in my Pickle Jar for comparison. The multiscreen should follow soon! I also wanted to mention that all posters and canvas prints are 60% off today and tomorrow on Zazzle if you use the code "CANVASMOMENT" at checkout. Enjoy! I've added "Synthestructure II" to the Members Gallery this morning. A number of you saw the first version and remarked on how it metallic it looked. I took this theme and ran with it for the second version. I've zoomed in a bit (to better accommodate the future multiscreen version) and inserted some little "filigree" items for contrast. I hope you find it an improvement. The new tropical render will be posted just as soon as it finishes rendering. I'm not sure if it is a Vue 11 bug or not, but this render is taking far longer to complete at 3277 x 2048 than my preview renders had lead me to estimate. Did I mention that I was looking at building a new renderer? As soon as the right memory becomes available I will be building a companion machine for Bucephalus so I can keep designing while these "epic renders" complete uninterrupted. Hopefully the GTX 480 survived the short out that took down my "Hydra" workstation in Jan so I won't have to purchase a new video card. Lastly I wanted to mention that those of you on Pinterest can follow my latest artwork here. Happy Pinning! I've added "Synthestructure I" to the Members Gallery this afternoon. This abstract was created using a new piece of software that I've been learning called "Structure Synth". It basically allows you to create 3D geometry by writing little scripts. You can try it for yourself here. Unfortunately I am still waiting for my new tropical project to finish rendering. I will have it up for you as soon as it is ready! T-shirts and mugs are 25% off with the same coupon. My new render is taking a bit longer to process than had hoped but it is making progress. I would love to be making final revisions on "Windflower" in the meantime but unfortunately since my "Hydra" workstation went down in January I haven't had a machine capable of handling some of the denser scenes that I've created on Bucephalus. Here's a look at my hardware wishlist that you can keep in mind when you are deciding whether to purchase or renew your Membership. If I could build Bucephalus II (need to come up with a better name) plus add a decent mobile workstation then I could work on 2 or 3 "HD" projects at a time. I would also like to add another couple of 30" monitors to Bucephalus so I can finally test rive my multiscreen renders before posting them. If you do decide to join, please check out the little boxes provided for adding a small amount to my general hardware fund. Every little bit helps! I've added a dual and triple-screen version of "Windflower" to the Members gallery this morning but I can't say I am 100% happy with them. I had a great deal of trouble trying to fit the entire flower into the wider frame. In the end I decided it was better to crop out a bit than add extraneous geometry on the side. What do you think? 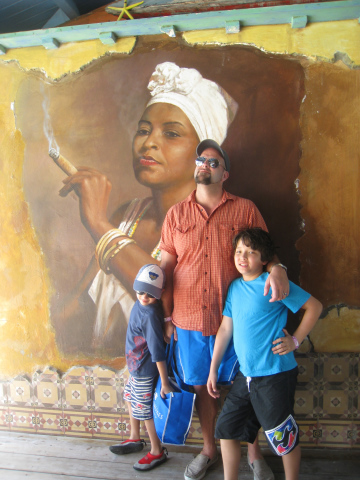 You may have noticed that things were a bit quiet around DB last week as I stepped away from the computer to rest and recharge my batteries with a little family vacation. We've had a pretty rough year so far and this trip (which we'd been planning since last year) really helped. It's also nice that spring has completely spring in central Illinois. Coming back to The Brown would have been depressing. First order of business: I wasn't able to finish the "Windflower" multiscreen before leaving so I am working on putting that together now. Thanks for being patient multiscreen Members! After that I am completely open as to what to render next (though I am leaning towards something tropical). Added "Windflower" to the Members Gallery today. It's a floral experiment (modeled using Xfrog and rendered using Lightwave 11) that I started after seeing a photo online of a Blue Anemone Windflower. The end result didn't turn out a whole lot like the original flower, but I kept the name. Still a few issues to work out with this one, but I think it looks nice enough to share as is. I've also added a red version in the Pickle Jar. Added "Portals" to the Members Gallery this afternoon. A number of folks have mentioned to me that I should update my " Login" wallpaper. This piece is in the same spirit as "Login" but also continues an idea I started in "Portal". 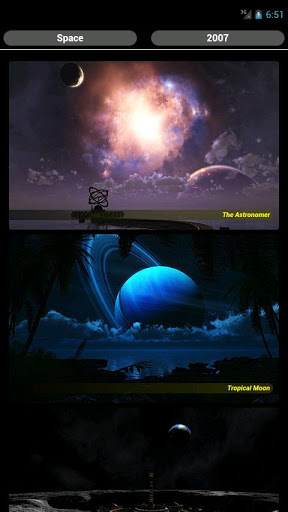 The images I used here, from left to right, are "Extrasolar" (flipped horizontally), "The Beginning of the End", "The Fisherman", "Planitia", "Tropical Moon of Thetis", and "Phraxis Moon". This is my first render using the release version of Lightwave 11. I had to do a special render for the 2048 x 2048 (and 1024 x 1024) versions so all 6 windows would fit on the screen. Dual and triple-screen versions are available. The idea came to me during a recent long stretch of solo driving. The base inspiration for this piece was the Star Trek original series episode "All Our Yesterdays". I honestly didn't know if I was going to have enough related images to create a "spectrum" effect so that working out was a happy little accident. Anyone using the new iPad this morning? I've added a free sample from my new "Retina" collection of wallpapers as well as a version for the iPad 1 & 2. Members have access to over 125 wallpapers for the new iPad and over 340 for the iPad 1 & 2. I've added a couple of multiscreen renders today. First up, the dual and triple-screen versions of "Red Sky At Morning" are now available in the Members Gallery. I've added a free "Facebook Cover Photo" version here. I've also added the dual and triple-screen versions of "Redfern Forest" to the gallery this morning along with a free version for use as a Facebook Cover photo. Just FYI: My entire collection of Facebook Covers can be found here. This one took quite a while to finish on my alternate box while I rendered newer projects on Bucephalus. One of my goals for this year is going to be purchasing a backup renderer approaching the same class as my main machine. As things are a 24-hour render on my main machine can take nearly a week to finish on my 4-yr old alternate box. I would love to get these multiscreens out sooner! You may have heard that Apple is releasing a new iPad shortly. I first heard whispers last July that the new iPad would have a 2048x1536 display and I've been rendering my images at 3277 x 2048 ever since. The new model requires wallpaper to be at least 2048 x 2048 so you can get the full resolution whether you are in portrait or landscape mode. Today I collected together all of my highest resolution renders and created a set of 123 wallpapers designed to show off the shiny new "Retina" display. Most of my newer work has a 2048 x 2048 version available, along with some old favorites. These wallpapers are available now in my Members Gallery but it will probably be easiest if you grab the entire archive from my downloads page. Please let me know if you have any questions or comments. I hope you enjoy them! I've added "Red Sky At Morning" to my Members Gallery today. I've always been fascinated by how sunlight from below the horizon and that is the general theme I am working with here. Other examples of this include "Afterglow" and "Extrasolar". I probably could have added more in the foreground here but I really wanted it to be mostly about the sky. Starting the multiscreen now and hope to have it up shortly. Thanks to everyone who signed up or renewed over the past few days as I offered my final coupon code! If you missed the sale there is still a way to get 25% off your Membership or Renewal. Purchase yourself a copy of ChronoWall and you will receive a coupon code that will work on my site! ChronoWall really compliments my artwork and I recommend everyone give it a spin! If you are already a DB Member you can save 25% off of the purchase price of ChronoWall by using the coupon code listed here. PS: I hope to start adding images sized for the new iPad (2048 x 2048) sometime next week. Anyone planning on picking one up? Last year I added "coupon codes" to DB so I could offer a special discount every so often. It was nice to start with, but over time I have come to realize that a lot of folks were "waiting for the next special" and that's not where I want to be. There was also the awkward position of offering a discount only minutes after someone had signed up at the regular price. I have decided going forward to keep only the three coupon codes I have in place for education discounts (code: learning), military discounts (code: liberty) and returning Members (code: iamback). The discount for people who purchase Chronowall will also remain in place. I am offering one last coupon code today through midnight 3/7 (code: lastsale) for everyone who has been waiting for the next one and then I will be discontinuing all other coupon codes. All Memberships and Renewals are 25% off from now until midnight 3/7 if you use the coupon code "lastsale". Renewals are added onto your current Membership so you will lose nothing by renewing during this last special. Get 'em while they are hot! Feel free to leave any questions or comments in the thread below. Thanks everyone for supporting my work!! Back in early January I added a collection of free images for use with Facebook's new "Timeline" profile format. So many people have enjoyed using them that I've given them their own gallery on DB so you can browse through them a bit more easily. As always, Digital Blasphemy Members can download them all in a handy zip file on my Downloads page. What exactly is a "Facebook Timeline Cover"? Click here for more info. The multiscreen of "Redfern Forest" is now rendering on my alternate box and I have a new project rendering on Bucephalus. Stay tuned! I've added a third (and most likely final) version of "Redfern Forest" to the Members Gallery this morning. I've darkened the tree bark considerably and scaled back the displacement mapping on the tree trunks. They should look less jagged but still retain some texture. I also dialed back the atmosphere quality a bit so it would render quicker. I haven't really changed anything with the composition. It's not perfect but I'm ready to move on. Multiscreen render next! I have brought back the Digital Blasphemy User Gallery and am now accepting submissions again. If you've been inspired by my artwork or just feel that my users would enjoy your 3D renders please feel free to submit your work! I have a new landscape project going now so I doubt I will do any versions of this one. No ETA yet but it is showing promise! I've added the dual and triple-screen versions of Annuli to the Members Gallery this afternoon. I've added a free version for Facebook Timelines as well. I've also added a version in the Pickle Jar with the focal point a little closer to the camera. What do you think? Should I add a few color variations too? Lastly I wanted to share this short video of Ian playing with my Dad. I shot it back in 2006 and times like this were the reason I moved my family cross-country 7 years ago. I've added "Annuli", my third Mandelbulber abstract, to the Members Gallery this morning. I've gotten in the habit of playing around with Mandelbulber on my Macbook Pro while my other workstations are busy rendering Vue or Lightwave graphics. It seems to be the only 3D art program I can use on my MBP without crashing the video card. I'm still learning Mandelbulber so my early renders are still all about trying different aspects of the program. I was learning how to use different light sources for this particular render (rather than shading the model directly). I should have a multiscreen render up shortly. I've added one final version of "The Floating Garden (Twilight)" to the Members Gallery this morning. I've replaced the orange sunlight with moonlight and brought back the green water. It's quite a bit darker than the Pickle Jar versions (all with orange/pink sunlight) but I think it fits better with the original. Dual and triple-screen versions are available for Members and I've added a free version for Facebook Timelines here. A couple of other items to mention. First, I've added "Hidden Forces" to the Free Gallery. If you like the wallpaper check out the dynamic PS3 theme from Disruptive Publishers (YouTube). Also, I have put together a small sampling of my late Father's artwork here if anyone is interested. Dad went to Illinois Weslyan University on a football scholarship but injured his knee early in his freshman year. He never played college football again but while he was recovering he took up painting. I'm not sure if he ever took any art classes, but he enjoyed being creative until the end. I've decided to run a quick special so until midnight save 25% off all Memberships and Renewals by using the coupon code "valentine". For those that who haven't yet signed up I've added "Hybrid" to the free gallery today here. Members can find a few more resolutions here and my two other "Valentine's Day" wallpapers here. Enjoy the roses and feel free to share them! I've added one more version of "The Floating Garden (Twilight)" to the Members Gallery this morning. This one is somewhere between the first two. I've cut back on the sunlight a bit and turned back on some of the lights in the water. I'm sticking with the blue for now. I haven't, of course, had a whole lot of time for artwork these past couple of weeks but I am looking forward to being creative again. I've also added the dual and triple-screen versions of "The Unveiling" this morning. You will also find a free version of "The Unveiling" for use on your Facebook Timeline profile here. The multiscreen took a bit longer to render than usual since my Hydra workstation shorted out last month and I am down to my 3rd string renderer. It has been a very difficult past week for me and my family but having all of these great pictures of my Dad really helps. A lot of people thought (and still think) that I was crazy to move my family from sunny San Diego back to farm country. 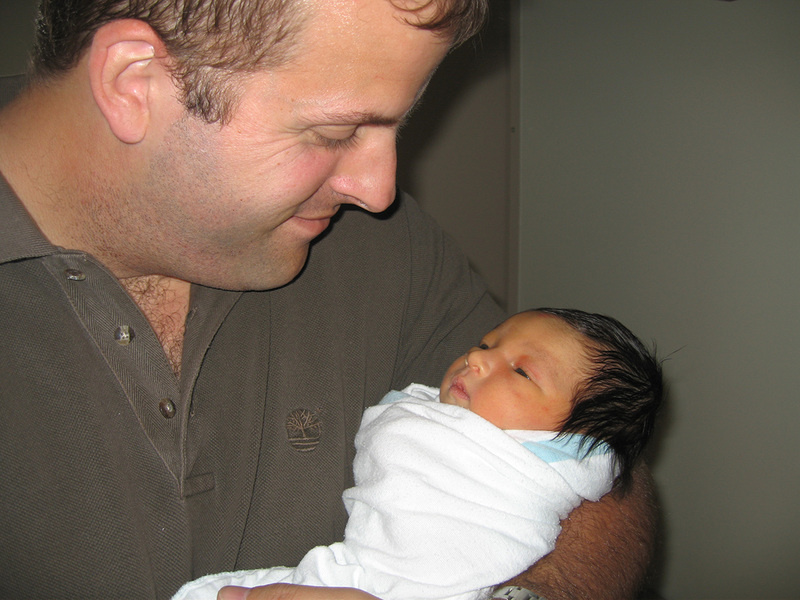 It seemed like an easy decision at the time because I was infected by the joy my parents shared at the arrival of my son Ian. As I wrote on this page back in 09/2004: "Those of you who live in the Midwest may think that I have gone crazy. We are giving up the best weather in the country and moving back to blizzards, ice storms, and sub-zero temps (and the opposite extremes of heat and humidity). It does feel a little crazy, but Jessie and I have decided that it is more important that Ian grow up with an extended family who loves him." I've been looking over the photos of my Dad and two boys over the past 7 years and I still think we did the right thing in moving back to Illinois. I am happy that I got to reconnect with my Dad but I don't know if that makes his passing easier or harder. All I know is that I will miss him dearly and I am glad he was a big part of my life these past 8 years. Be on the lookout for a possible "sunset" version of "The Floating Garden" in the days ahead. I am really looking forward to making new artwork. I haven't had a lot of time for making artwork this past week. I had a few moments alone yesterday however and I used them to put together a multiscreen version of "The Floating Garden". Members can download it here. A free version for Facebook Timelines is available for all to use here. I still consider this scene to be a work-in-progress so don't be surprised if another version or two supersede this one. I have already posted one Pickle Jar version from early on. The whole creative process was horribly interrupted. I also wanted to mention that the fine folks at Disruptive Publishers have released a new dynamic PS3 theme based on my "Hidden Forces" wallpaper. Here is the rest of their collection. Their work keeps getting better and better! I would just like to say thanks to everyone for the kind words posted here and on my Facebook account regarding the recent sudden loss of my father. I am still reeling from all of this but it helps that my four brothers and my sister are all together now sharing stories and laughing/crying through our memories. The hardest part of all of this, for me, is thinking about what my two boys are going to miss out on. I feel like I am greiving for the three us. Seven years ago my wife and I made the decision to move our family from sunny San Diego back to my hometown in Illinois so my kids could grow up with two grandparents around. Rather than rue the past however, I will try to be thankful for the few years we did have together. One thing that I always knew about my Dad was that he loved to make things, whether it be music, painting, or Christmas presents for his grandkids. He loved telling stories. I would like to think that his creative spirit will live on in my work. I am looking forward to sharing some of his paintings with you in the weeks ahead. I've added "The Floating Garden" to the Members Gallery today. I've been working on this project for the past week or so and the render finally finished yesterday. Now I haven't decided if I am truly finished with it or not, but I thought it looked nice enough to post as is. I am not sure when I will be able to pick up work on it again. I had thought to dedicate this to my father, but decided against it. I will create something more fitting in the future. Thanks again to everyone for the condolenses and prayers. They have helped more than you can possibly know. 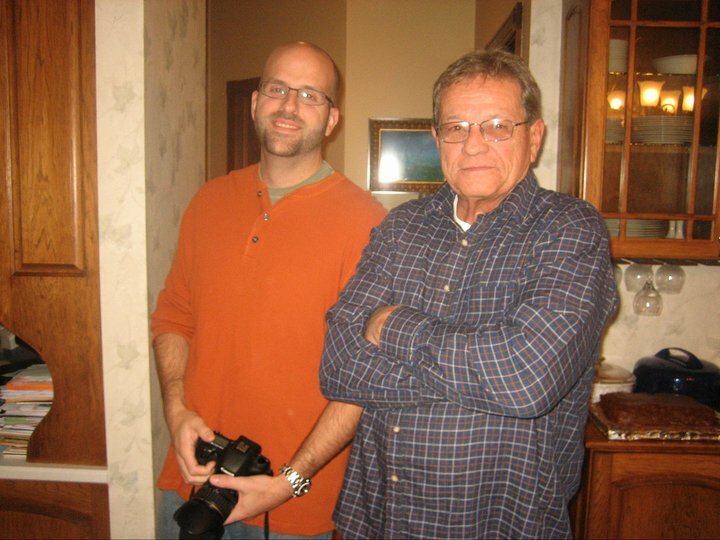 I just learned this morning that my father, Thurman Bliss, had an accident at his house last night and is gone. He was 66 years old. 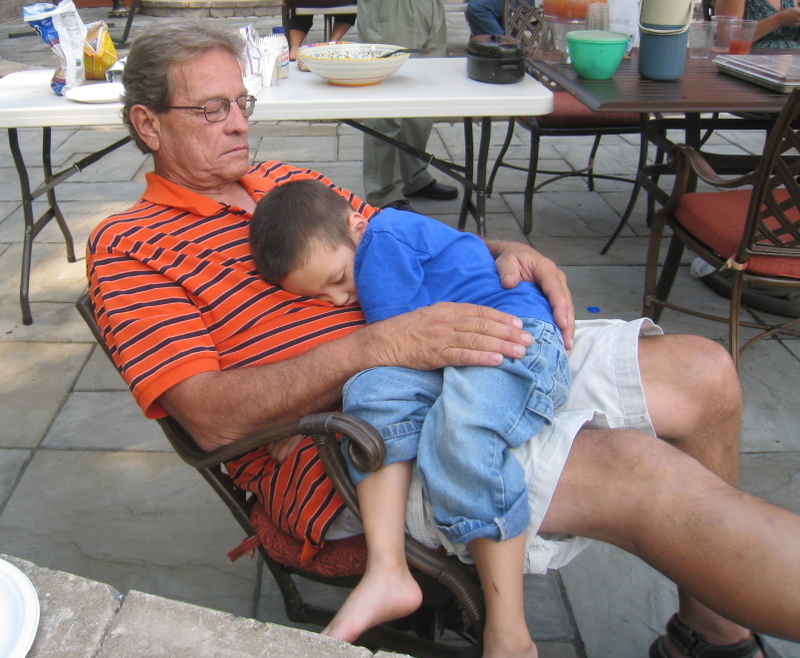 I am thankful that my last words to him (a few days ago over the phone) was "I Love You Dad". My Dad was a farmer, a musician, an artist, and a great friend to his grown children. I know he was extremely proud of DB and the fact that so many people around the world enjoy my work. I know he wouldn't have wanted anyone to be sad at his untimely passing, but then he doesn't get to make that call. I've added "The Unveiling" to the Members Gallery this morning. This is a sequel of sorts to Enshrouded which I have put together to test out Vue d'Esprit 10's "Advanced Cloud Modulation" techniques. Basically it allows me to contour the cloud layer to the curve of the terrain, so they appear to drape naturally over the landscape. It's a tricky procedure which I hope will be made simpler in future versions of Vue (so I don't have to edit height maps in Photoshop hopefully). To be honest I'm not even sure the effect is all that noticable in this render. It is a powerful tool however, and one which I hope will bear more fruit in the future. Thanks to everyone who voted for me in Lifehacker's "Top 5 Wallpaper Sites" poll! The poll closed late last night with DB leading Wallbase by 544 votes. You are now reading the web's "Most Popular Wallpaper Site", according to the readers of Lifehacker. It's pretty amazing that a site with only 12 free wallpapers and a creaky interface can win out over over ones with the latest designs and millions of free files. As a token of my appreciation please enjoy "The Fisherman", my first release from 2011 in the Free Gallery. If you would like to become a Member then please use the coupon code "lifehacker" to save 25% off all Memberships and Renewals until midnight tomorrow! As a show of support my friends at DecalGirl are offering 38% (my the percentage of the vote) off my entire skin collection. Use coupon code "LIFEHACKER" to get the discount. The readers of Lifehacker have selected DB as one of the top 5 wallpaper sites online. It now comes down to a simple poll question to decide "the best". I'm in some pretty good company so I hope you will have a look at the competition and then vote for your favorite! As for me, I'm just thrilled to be in the top 5 given that my site is Member supported and I am the only "single artist" on the list. Thanks for all the nominations! Last week I added a set of free images sized for use as "cover images" in the new Facebook "Timeline" profile layout. In the process I was going through some of my older work and came across "Moonlit Oasis" from 2009. I remember it was a bit controversial when I posted it because quite a few of my Members said it was too dark. I stuck to my guns at the time, but now I can really see their point. I opened up the scene file (in Vue 10 this time) and tweaked the lighting and atmosphere just a bit and re-rendered it. The new version is now available in my 2009 gallery (I'll have to put an asterisk or something) and Members are welcome to download it. Dual and triple-screen versions are available along with a free version for use as a Facebook profile cover image. You can also find it in poster form on Zazzle. I will let you be the judge as to whether or not it is better than the original. Art is never finished, only abandoned. . . I've added the dual and triple-screen versions of "Archaea" to the Members Gallery this morning. I chose to zoom in a bit for this one so the "object" would span across multiple screens. Hope it works for you! I've also added a free Facebook Cover Photo version for use on your Timeline. Enjoy! I've added the dual and triple-screen versions of "Gotham Garden (Winter)" to the Members Gallery this morning. This one was a bit tricky to convert because moving the camera completely changed the lighting solution. I tried to match the single-screen as best I could but you be the judge. One more addition the Members Gallery before the weekend. "Archea" is a Mandelbulber experiment I started on my Macbook Pro while I waited for my other machines to finish their renders. The problem is with the mobile Nvidia 3D card, but since I am one of maybe a handful of people trying do 3D work in Windows on a MacBook there aren't many resources available to fix the problem. The term "Archaea" refers to a group of single-celled organisms similar to bacteria. They don't really look like this (that I know of) but I liked the name. It's not easy naming these abstracts. I hope you enjoy it and don't forget to check out my free Facebook Cover Images. I've added dual and triple-screen renders of "The Gardener (2012)" to the Members Gallery this afternoon. 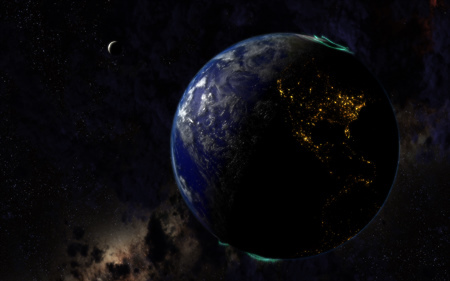 The astronomically observant will notice that I've removed the glow around the planet for this version. The single-monitor version will be updated soon. Hope you enjoy it! I should also have the multiscreen version of "Gotham Garden (Winter)" finished shortly. I also wanted to mention that I have added 248 images sized 850 x 315 to be used as Facebook "Timeline" cover images. You can check out an example at my own personal profile page. These images are free for everyone to download and use. I haven't slapped a huge watermark on them (as I've seen on just about every other downloadable Timeline image) but I would certainly love it if you would include a link to DB (http://digitalblasphemy.com/ is fine) with the image. As I said, they are free for all to download (look under the 850 x 315 image links under "Free Mobile Wallpapers" on my image pages). Members do have access to a zip file collection containing all 248 files here. Happy 2012 everyone! I added "The Gardener (2012)" to the Members Gallery this morning. This was either going to be my last project of 2011 or my first of 2012. It continues themes that I first explored with "The Gardener" in 2000 and 2002 and "Atrium" in 2004. Also wanted to report a bit of a setback in the hardware department. My Hydra workstation (pictured on the right here), which had been my main renderer from 2006 to April of last year, bit the bullet hard last week when the motherboard shorted out. I'm trying to decide right now whether to try salvage the system with a new MB (and potentially dodgy memory/components) or put together an all-new alternate renderer. Regardless, your Memberships and Renewals are needed more than ever. Thanks!! PS: Hoping to have the "Gotham Garden (Winter)" multiscreen finished within a day or two!